3 Vessel Brewhouse includes: Mash/Lauter Tun, Kettle, and HLT. Heating Elements (36.2 amps per unit, 15kw) on the Kettle have been seriously upgraded to achieve a 30 minute boil. Also Includes: brewhouse platform. With 2 variable speed pumps and wort chiller. Siemens computer systems, brewery controls. One system on the wall and another kiosk on the platform. -Electric -only used 10 mos. -Make your best offer. 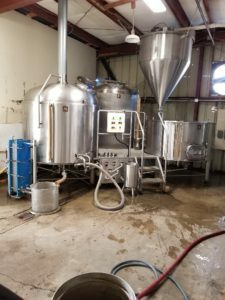 600 Gallon Brand: Bridgetown Brew Systems Direct Steam Injection ProSeries 2 HP top-mounted agitator included 15-inch hydrofoil 316SS impeller False Bottom Price: $16,500 Height: 117" Diameter: 61"
Complete 15 BBL ABE brewery for sale. Commissioned May 2017. 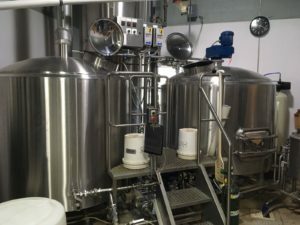 15 BBL steam powered 2 vessel brewhouse with automation and touch screen control panel, mash rake, single stage HX, external wort grant with auto controlled run-off, hot/cold blending assembly, flow meters 30 BBL HLT and CLT tanks with pumps, 1.5 HP mobile transfer pump, 100' brewers hose. 4 x 15 BBL dual cooling zone uni-tanks, 7.5 ton coolshot chiller, GF ABS glycol system, 6x6 single pair malt mill with flex auger and floor standing grist case, 5 tank fermentation control panel. Columbia MPH30 boiler, 1000 SQFT walk in cooler, Premiere 2 head keg washer, 200 half barrels, 200 sixth barrels, cask engine, air compressor. 8 tap SS beer tower with 30' glycol trunk. Buyer responsible for loading and transportation. Will part out if needed. PM if interested needs to move fast. Price negotiable. Mash/ Lauter, Kettle/ WP and 35bbl HLT. Steam fired. American made. 6 years old. After market modifications. Available mid May. 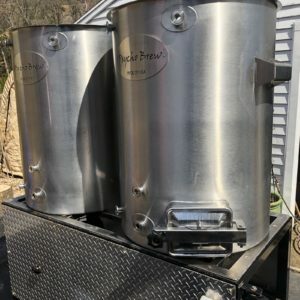 5 BBL Electric Brewing System Available for Immediate Sale - Kettle & Combi Mash/HL - (1) 5-BBL Fermenters and (1) 5-BBL Bright Tanks Available in Pennsylvania. Includes everything to get up and running including the electric breaker panel and stack.